The king stropharia (Stropharia rugosoannulata), a fungus known by many names including garden giant and wine cap mushroom, has been a long fascination of mine ever since I began exploring the world of wild and edible mushrooms, and my existing attempt at cultivating it just took a pretty wild turn. Over the past week, there were 2 or 3 days with pretty strong 100+ km/h winds which happened to be strong enough (in addition to the ground softening up after a recent temperature swing of -5 to -10 temperatures followed by a sudden thaw) to tip over a fairly large and old blue spruce (Picea pungens). Unfortunately, the patch of wood chips and mulch that I had colonizing with stropharia mycelium was located directly underneath the tree, whose root ball ripped up and flung wood chips and mycelium all over the immediate vicinity and totally up-ended nearly 3/4 of the whole bed. However, nature always presents opportunities in the face of dramatic changes. I had started stropharias back in May (with a buddy of course) by gathering up some wood chips* and finding a location with partial sun and partial shade and good drainage. King stropharias enjoy a little more sunlight than other (un)commonly cultivated mushrooms and so dappled shade is not the most suitable location but may work if that’s all you have. 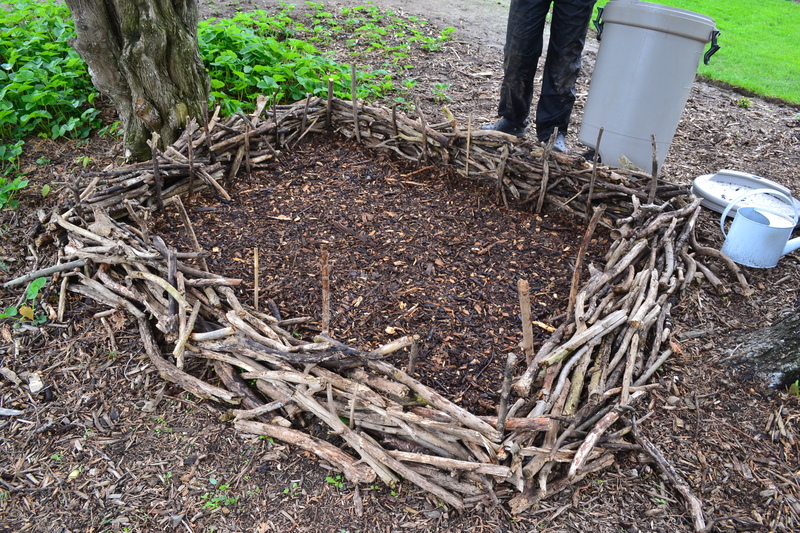 We made a rustic fence of fallen twigs to help hold in the 8-10 inch deep layer of mulch. After filling in our designated area (roughly 6’x5′) halfway with wood chips we broke up and sprinkled in a 5 lb. sawdust spawn bag of king stropharia mycelium. After adding an equally thick second layer of mulch we thoroughly wetted the entire area (with rain water – preferably not tap/house water) and allowed the fungi to take over and colonize. By the end of November I was seeing pretty decent colonization with typical ‘islands’ or groups of mycelium forming in certain areas in the overall patch but slowly growing and unifying over the course of the growing season. This pattern of growth and colonization is fairly common with king stropharias. Although I had hoped for an autumn fruiting I was looking forward to perhaps one in late spring or early summer of next year. Alas, mother nature decided that she ought to interfere with my intentions without my permission, but I also saw this as an opportunity to perhaps relocate to an area that could be more suitably for the stropharia bed. I tried my best to save as much mycelium as possible, digging through the wood chips, earth and roots that were all mixed together right near where the original patch was. I found some really nicely colonized chunks of mulch that were entirely stuck together by thick pieces of mycelium and soil. The characteristic rhyzomorphs were also present; an important ID feature for the mycelial threads of king stropharia. These rhyzomorphs are easily transplanted into more substrate, a characteristic that makes this whole undertaking possible. Once you have stropharias growing around, you have them for good, because you can ‘divide’ and ‘plant’ the mycelium in different locations with suitable conditions just like one does with some perennial plants. 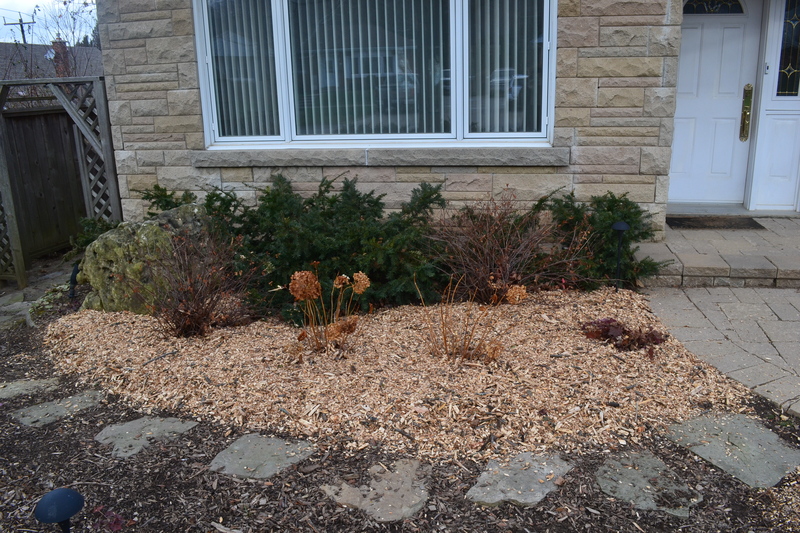 Before I knew it I had accumulated a bucket full of colonized wood chips, mulch, and soil. That same day, I was able to get a hold of some more mulch. This time around, the wood chips were more finely chewed up than what I had acquired the first time around which I figure will allow the mushrooms to colonize faster and easier due to the higher surface area. I also noticed that there were a few bigger chunks in there as well, which ought to take longer for the fungi to break down and thereby keep them fed. The type of wood, judging from the few identifiable twig segments that I found throughout the wood chips, appears to be mostly ash (Fraxinus spp.) with a little bit of willow (Salix spp.) Ash is a nice, hard wood which king stropharias love. Oak, sugar maple, hickory, sycamore etc. are also good choices. Softer hardwoods, like poplar, silver maple, willow and birch are still good but less productive and most conifers are to be avoided except for possibly Douglas-fir (Pseudotsuga menziesii) and hemlock (Tsuga spp.). I relocated the patch to a south facing wall where the afternoon sun will by blocked by an overhead Norway maple. The mushrooms will be growing amongst perennial hydrangeas, spirea shrubs and English yews. King stropharia mushrooms are well suited to being grown in mulch (or a mulch/woodchip/straw mixture) surrounded by and amongst plants, whether long season vegetables or ornamental perennials. The plants benefit from the nutrient byproducts released by the fungi as it decomposes the wood chips and the plants provide the mushrooms with shelter, a localized microclimate and increased moisture retention and humidity. This symbiosis is something that is largely underutilized, considering that in addition to happy plants (=happy veggies and food) and happy soil, you can to harvest crop after crop of mushrooms to enjoy. From what I understand, they are at their best when still in their ‘button’ stage, or at least before the cap begins to flatten out. I have never tried king stropharia mushrooms before, but I have read that they are quite flavorful and meaty, with both the stalk and caps edible and unique in their own ways. Did I mention that mushrooms left to mature will distribute spores which may decide to establish new colonies in areas of your yard/neighborhood all on their own? 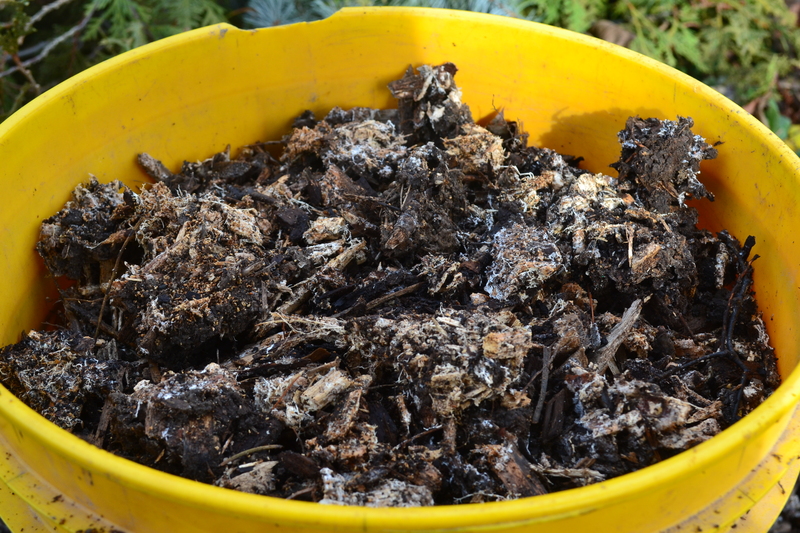 If you wanted to ‘encourage’ them to grow in certain areas, stem cuttings of the mushrooms themselves can be buried in fresh piles of mulch or pieces of mycelium from established colonies transplanted and watered in. As you can see, I’m a little bit too much of a keener for king stropharias, and I can’t wait to try my first one. It’s going to be too much to handle, I know it. So to start the new patch, I essentially followed the same procedure as I did with the first. I laid down a 3-4 inch layer of mulch to which I scattered over top the pieces of scavenged mycelium from the old patch. I buried the entire thing in a 4-5 inch layer of wood chips and then watered the patch thoroughly. With luck, the transplanted king stropharia will flourish in it’s new home and I’ll then be able to write the second installment of this series: the harvesting and continued care of your own private edible and self-perpetuating mushroom patch. I’ll also discuss some more identification features for the species, as there is always the potential for other edible or non-edible mulch and wood chip loving fungi to also grow with the stropharias. Click here to check out Part 2, where the original patch that got obliterated earlier in the season miraculously produced it’s first crop of mushrooms in September, a year and a half after they were started! * If you live in the Hamilton area, you can get an unlimited amount mulch and wood chips for free from the Hamilton Forestry Operations Center. near the intersection of Upper Ottawa and Stone Church road. Hours are 9am – 4pm or 5pm during the day and are open to the public Mon-Fri during the warmer seasons, possibly weekends as well. Alternatively you can contact utility companies/arborists/city workers who are often looking to get rid of some unwanted wood chips at no extra cost.